Since the September is already started, even on sunny days I have need to wear warmer clothes. I don't know about you, but season change has more influence on my mental state then physical. It is crazy, I know. Today I am showing you an outfit for not so hot days.This outfit is from Yoins. 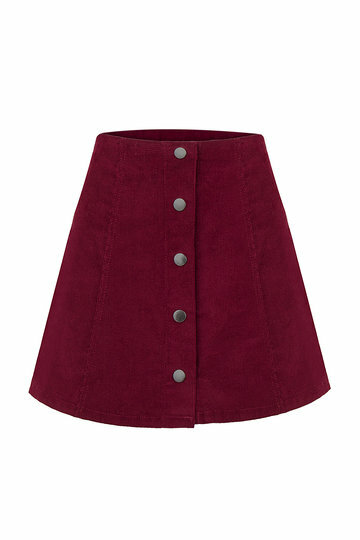 I think that is perfect for autumn especially because of this burgundy skirt. I adore this color. And this backpack is to die for! I love it so much! I hope you will like this post and don't forget to visit Yoins for more! This post is sponsored by Yoins. Cool outfit. It would be perfect for autumn with that maroon skirt. Loving the items.That backpack is so cool. Great outfit! I need those shoes in my life. Loving this combo! The stripe jumper is so cool! I love it! perfect transitional look! I love how you pair this striped sweater with that maroon skirts, what a pretty combination and thanks so much for the outfit idea! fun picks! those flatform shoes are awesome! Gorgeous picks, thanks for sharing! so cute i love the skirt !! Love this, babe- so cute! Cute combo! Love the shoes! Great look! I love the maroon skirt! I love that striped sweater so cute!! I love all of your selection from Yoins!